edo Tone’s new suit for 2009 is a good, nicely textured and shaded classic black suit (also available in blue, red and white). There are many color combinations to choose from, shirt and tie combos and different color hankies on the suit jacket. I’m showing it here with a white shirt and black tie featuring a cool Styles of edo logo. (These are the kind of details that are really appreciated. I think the flying horse logo really adds to the overall look of the suit.) Another thing I appreciate about edo’s suits is that the details like collar, cuffs and buttons, are drawn, not prim attachments which frankly can look awkward without perfect adjustment. I chose the jacket with the silver hankie to show here. The black pants have a nice belt that shows through the slightly opened jacket bottom. Again, a nice touch that gives this suit character. I chose the Allen shoes in black from Hoorenbeek (reviewed in depth recently by Ben). Nice dress shoes, but the lack of a tie is a little disconcerting. 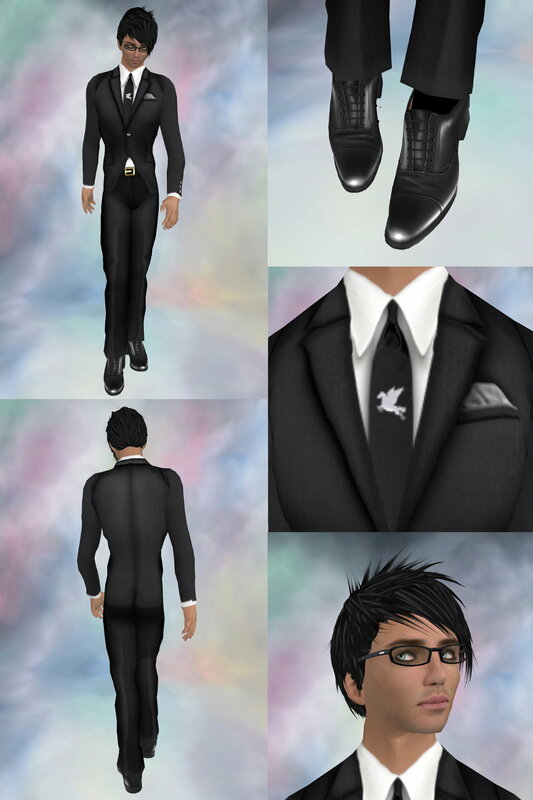 Still, there aren’t a lot of good classic dress shoes for men in SL, and these are a great choice to wear with a suit. Finishing off the look, the Sofia glasses from PrimOptics (yes, I admit, they’re a favorite accessory), and the Akami hair (resizeable by script, always a good touch, especially for new players, but still moddable) from MADesign. Note that Madesigns hair are from now on designed for a zero sized head meaning you can shrink them a lot to fit your avatar, even with a tiny head That’s really appreciated, since I’ve noticed some hair can’t be shrunk enough due to the SL limitations for prim size. Ben introduced my black 3 button suit 1 year and six month ago. But I sent a suit to him many times, but they disappointed him many times. And I fixed them in his studio many times.lol.I learned from Ben about SL Men’s fashion. I deeply appreciate Ben and Perry. I remake all suits every year. I will make an effort to make good clothes. Thank you Ben and Perry. Thanks for the work you do, edo! I don’t see a lot of glasses on men in sl that I like, but those are very cute. I’m not sure what the blogger was smokin’ but the suit is actually 1,000L and there is a pack that is 2,400L!! Well beyond 350L! Maksimilian, I am standing in edo Tone’s shop as i reply to your comment, looking at the 2009 Black Suit Coordinated 1, with Black suit, white pocket chief, black pants, and white shirt with black tie (as pictured above), priced at 350L. So, not smokin’ anything, dear, please take a look at the shop and make sure you’re looking at the same item I’m blogging next time. These are on the main floor of the shop under the sign marked “Transferable.” Cheers!